I hear summer's coming to an end, but in Southern California, it feels like we're just beginning. Sure, the kids are back in school, and the beaches are a 'little' less packed, but the thermometer often reads triple digits, and it hardly feels like Fall. Every September I find myself thinking back to that magical summer of '04 (which makes me feel extremely young), spent on the rocky beaches of Rhode Island. For anyone who has never been vacationing, or lived, Back East during the summer- there's a reason all the celebrities own vacation houses in the Connecticut area. The foliage is beautiful, the atmosphere is almost vintage, and the small town vibe plays out onto the far from crowded, clear water beaches. It's a far cry from the foamy, sea-green froth that bubbles onto our sand here in my local bit of 'Southern California' paradise. Yes, that's right, I'll take a Rhode Island beach any day! Memories of that amazing summer, tinted by the haze of young love, replay like old reels of film; slow and carefree with muted colors and the sense that time was literary standing still. I am not a beach person, but that summer, I drug my helpless boyfriend, kicking and screaming, rain or shine. His father, recklessly single and into construction was liberal with his responsibilities and I'd often find myself snuggling on the old wind washed porch, just 50 feet from the rolling waves. We'd play will the dogs, sea salt sticking to our skin, planning our future, and watching the sun dip beyond the horizon, before falling (exhausted) into bed at night. I was 18 and the world had nothing on me. Time was endless. The ocean was as blue as my lover's eyes, and I was sure life didn't get better. But, with the change of leaves, and a resistant roll into Fall, my first love came to an end...well, more of an understanding. He and I became 'friends', and I closed the chapter of my magical summer in Rhode Island. Do you have a summer memory, or romance you often reflect on? Disclaimer: I was not compensated/endorsed to write this post, it is simply a bit of old fashioned blogging....enjoy! I love the photos you chose for this post - beautiful colors and such a fabulous sense of nostalgia! And speaking of nostalgia, your description of your first love and summer was beautiful. It totally took me back to those "muted colors" days of my youth, as you so aptly described them. Thanks so much for sharing! Lovely post. So lovely! I like the good old fashioned blogging! 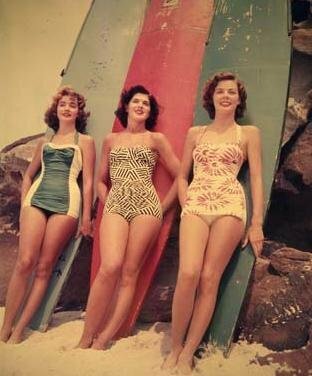 Those bathing suits - wowee - I wish they were still in fashion. Very nice post! I grew up in MD so we spend summers at Ocean City and Rehobeth Beach - I can totally relate to this post! I love the summer! 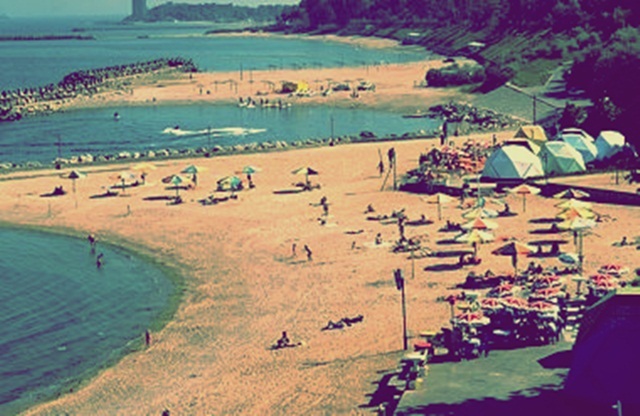 I live near the beach and I love being able to be with the kids and take them to the beach and out for ice cream, etc. I visited Gloucester, MA a LOT when I was little during the summers and I have many memories from these wonderful trips. Jumping the waves and rock climbing on the beach are among my fondest. Oh my goodness how beautiful and romantic. I have none of a romantic summer event but I do have one of the first time we took a family vacation and how wonderful it was to be with just my hubby and four boys and the sparkle and light that glistened in their eyes the first time they saw the blue waters that seemed endless and the white clean beaches of Panama City Florida. I felt so lucky to have such wonderful sons and the best hubby and father a woman could ask for. Thank you for such a beautiful story and taking me their with you. No summer romances for me but I do have fun in the summer thanks to the Jersey shore. I love the pics you chose for this post. My boyfriend and I met in the summer at school about 2 months before he graduated. We were just lucky I guess! I almost didn't even meet him at all. So when I think of summer I think of romantic stuff too. =] Beautiful post! Thanks for sharing. I don't know, I live back east and I would love to be in southern CA right now. The temperature is dipping into the 40s at night, way too soon! My summer memories were when my kids were little and we would practically live at Grandma and Grandpa's pool. It was like a pool party everyday. Your description of your summer is beautiful. I could almost imagine your sweet memory as I read this! It brought back memories of being a little girl visiting the MD shores, the salty air, shells, sea gulls and driftwood, sitting on a rustic porch reading my favorite Go Dog Go book. Time meant nothing..all the time in the world. I often think about summers my family spent on the lake when I was growing up in NY. No romance, but a lot of fun nonetheless. I sure do love summer time and all of the summer time memories that I have at the beach, but I am really looking forward to the fall!!! i live in northern california and today it is so hot! i love being an hour away from the ocean! love reading your posts! Summer love truly is the best kind of first love. I met my summer love on a family vacation out in the Dakotas. Our campsites were next to each other and we would sneak off at night to cuddle on the edge of the cliffs overlooking a wide lake and stare at all the stars. When the vacation came to an end, we said our goodbyes and he gave me a necklace, which I still have, and it was over. It was short and very sweet and I still think back on it with fond memories overtime I see the necklace in my jewelry box. It reminds me how truly innocent and kind love can be.